And so it begins! Camp has started and the campers are already hard at work. 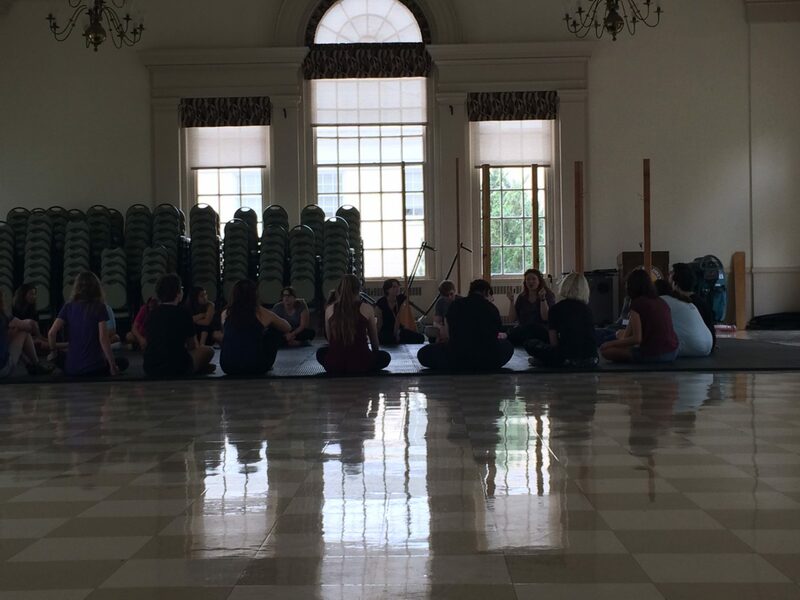 Pictured below, campers listen attentively to Alli Glenzer’s voice workshop, in which they discovered their “Cookie voices” (If you want to know what that means, ask a camper). Today they’re approaching their text workshop with the same enthusiasm. However, while the campers are working, I will be doing some dramaturgical work for Titus Andronicus, supplementing their knowledge of the play with historical research about its context and history. Here is behind-the-scenes look at the Titus dramaturgy world. Besides the script, you will see a Complete Works of William Shakespeare, so that I can compare our cut of the script with to an uncut, edited version, and my computer, there for dramaturgical research and the occasional Facebook break. 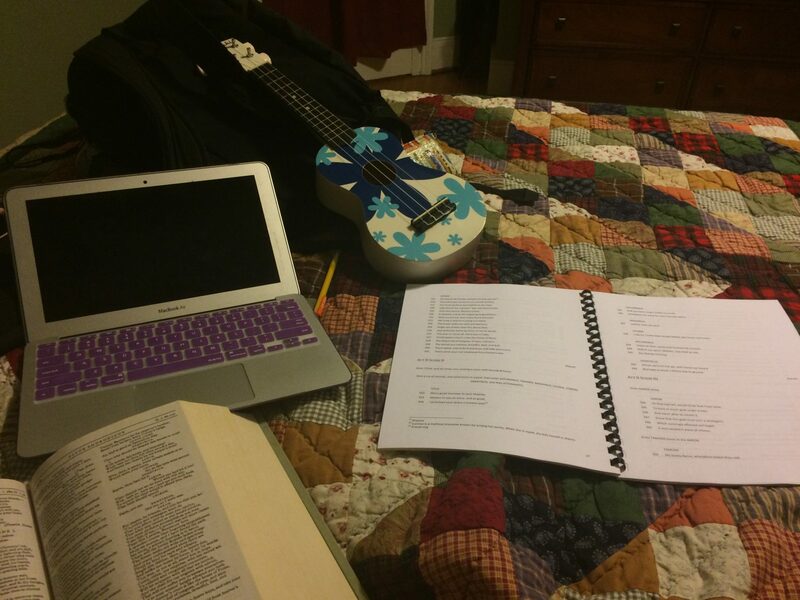 The ukulele, other than being there for my cool-theater-kid aesthetic, is so that I can start figuring out some arrangements of our pre-show music (song TBD). Which, by the way, is going to be amazing because we have five ukulele players in our cast. There’s a reason ukuleles are a theater kid staple, though. They are three important things most instruments are not: easy to move, quick to learn, and pleasant to hear. Bagpipes, for instance, are none of these things. At this point, though, I wouldn’t be surprised if a camper came in having mastered bagpipes because at auditions yesterday, we saw an incredibly wide range of talents. We had everything from accents to violin to ballet to gymnastics. Not only were the campers incredible to watch, but they were also ridiculously funny. Their interpretations of the assignments we gave were so creative and entertaining. I’m so thrilled to be working with them. Now the fun begins. Titus Andronicus is what we like to call in the dramaturgical world, juicy. Just kidding. No one in the dramaturgical world actually says that. Except me. Right now. But really, there’s a lot to unpack in this play. Racism, sexual assault, political corruption. Serious business. But not to fear, there are also lighter themes, like love and loyalty. But mostly the dark stuff. How have the challenging topics impacted the history of the performance of the play? How can we express these themes in a thoughtful and productive way? How can we make our production feel applicable to a modern to audience. These are all great question to which I have no answers. That being said, I am really looking forward to figuring all this out with the cast (or the Titus Androni-cast, as they like to call themselves. These people and their word play. It’s almost like they’re at Shakespeare camp or something). The process will definitely be difficult, but it will also be a great learning opportunity. The more we confront these topics, the better we are at handling them. I cannot wait to do so more research into this play’s dark history and share my findings with all of you! Oh no! I did some tinkering… any luck now?